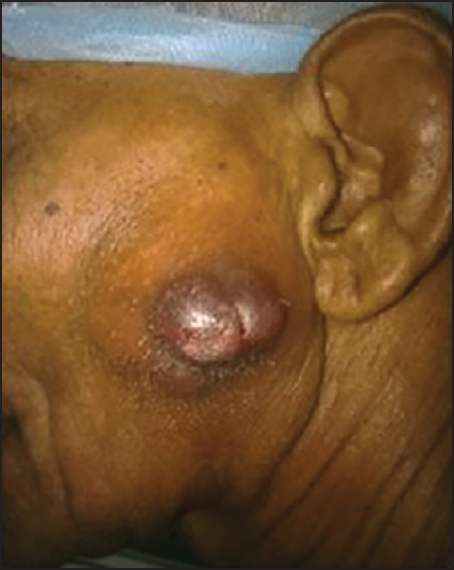 A 73-years-old male patient with a case of painless firm fluctuant swelling of left preauricular area [Figure 1] of 8 months duration is reported. The lesion was thoroughly examined preoperatively, and investigations were carried out. Patient's history included cataract in both the eyes and history of smoking since 40 years, which he left 2 years back. He denied any fever, chills, or night sweats. On physical examination, a firm, 2.5 cm mass was palpated at the left preauricular region. No lymphadenopathy was present, and all facial nerve function was intact. The results of routine blood tests were within normal limits. Findings on fine-needle aspirations were diagnostic. Microscopic examination of the tumor revealed moderate cellularity, comprising of malignant epithelial cells, arranged in a papillary pattern, clumps and singly. Some cells show squamoid differentiation. Others show eccentric nucleus, intracytoplasmic vacuoles and prominent nucleoli. Many cells with finely vacuolated cytoplasm are also arranged singly. Cells show pleomorphism, anisonucleosis and abundant cytoplasm. Background shows red blood cells. Computed tomography demonstrated a mildly enhancing, hyperdense, 2.3 cm × 2.5 cm mass involving left parotid gland. After providing appropriate consent, the patient was posted for a left superficial parotidectomy. General anesthesia was achieved with rapid sequence intubation and endotracheal intubation. Local Anesthesia (1% lidocaine with 1:80,000 adrenaline) was given. Subcutaneous injection of the anesthetic is administered over the whole operative field. A modified Blair incision was given. The incision was made in the preauricular crease including the lesion in a circular fashion around the lesion. The skin flap was raised to the superior, anterior and inferior borders of the gland. The flap was raised under the periparotid fascia. The fascia was included in the skin flap and the gland tissues are exposed. Blunt dissection with hemostat was done, and anterior border of the gland was exposed [Figure 2]. Stensen's Duct was used as a landmark for the identification of the buccal branches of the facial nerve. The skin flap is pulled by a retractor to expose the protrusion of the anterior border of the gland, where Stensen's duct emanates from the gland onto the masseter muscle, the retromandibular vein was used as a landmark for the identification of the marginal mandibular branch, and the zygomatic arch for the zygomatic branch of the facial nerve. Once the nerve branch was identified [Figure 3], dissection was done using fine-tipped hemostats to create tunnels in the tissue immediately above the nerve. The bridges of parotid tissue over the nerve are gently cut with a scalpel blade. The dissection displaced the parotid upwards and downwards, and hence, avoiding too deep and narrow tunneling. Great care was exercised to avoid inadvertent entry into the tumor during preservation of the facial nerve. 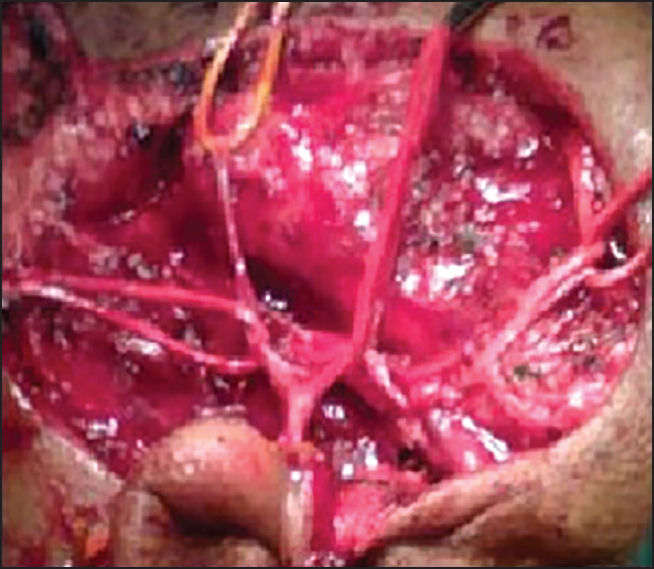 As the bifurcation and main trunk of the facial nerve was exposed, the gland was resected at the posterior border. 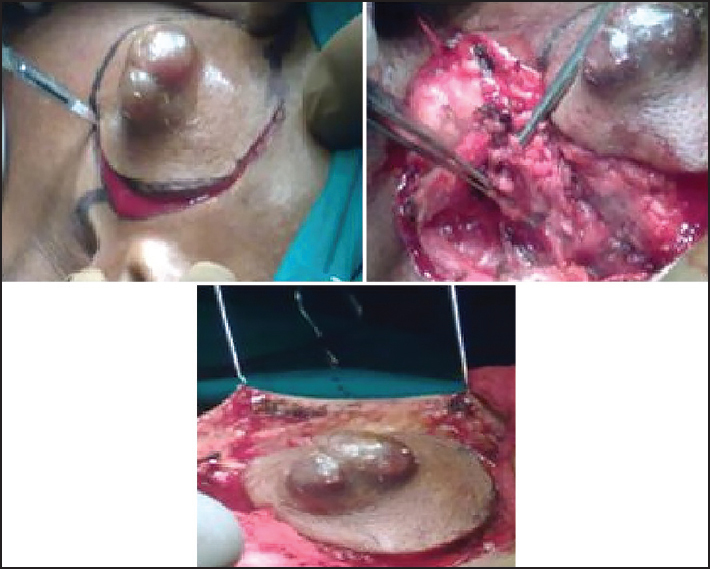 The parotidectomy was excised with the tumor "en bloc" [Figure 4]. The specimen was sent for histopathological examination. After removal of the superficial parotid gland and the tumor, the cut surface of the parotid remnant was sutured by absorbable sutures. This achieves hemostasis, and also prevents the development of a salivary fistula. The wound was irrigated with saline and the integrity of the facial nerve was checked. Closed suction drainage was placed and suction tube placed away from the dissected facial nerve to prevent damage to the nerve. The skin flap was replaced, the platysma muscle and subcutaneous tissues were closed with absorbable sutures. Finally, the skin incision was closed using 5-0 nonabsorbable sutures. Closed suction drainage with external pressure by gauze was maintained for 48-72 h [Figure 5]. Thereafter, a thin layer of gauze was placed on the wound. 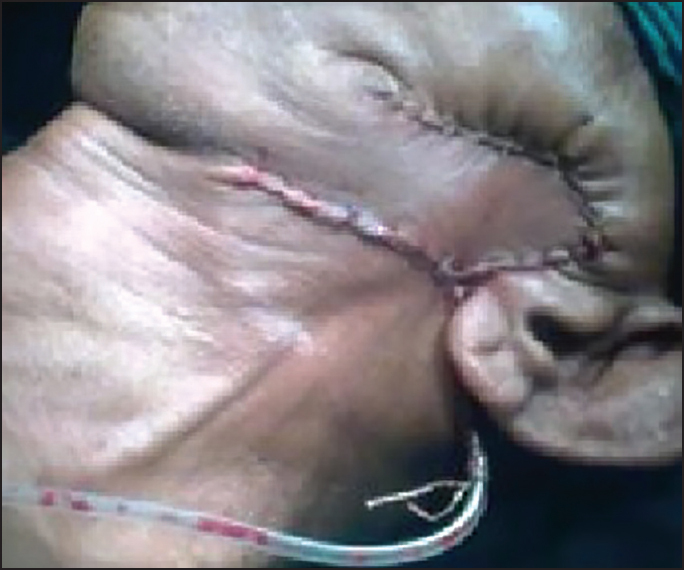 The sutures were removed 1-week after operation. Regular postoperative follow-up of the patient was done, but the patient's survival was not >6 months. Mucoepidermoid carcinoma is the most frequently diagnosed malignancy of the salivary gland. Among the major salivary glands, the parotid gland is most commonly involved. ,,, MEC has no distinctive cytological characteristic. The tumor is composed of epidermoid and mucin producing cells, which take origin from the duct epithelial lining. The epidermoid cells proliferate in sheets or islands, and keratinizing may occur. 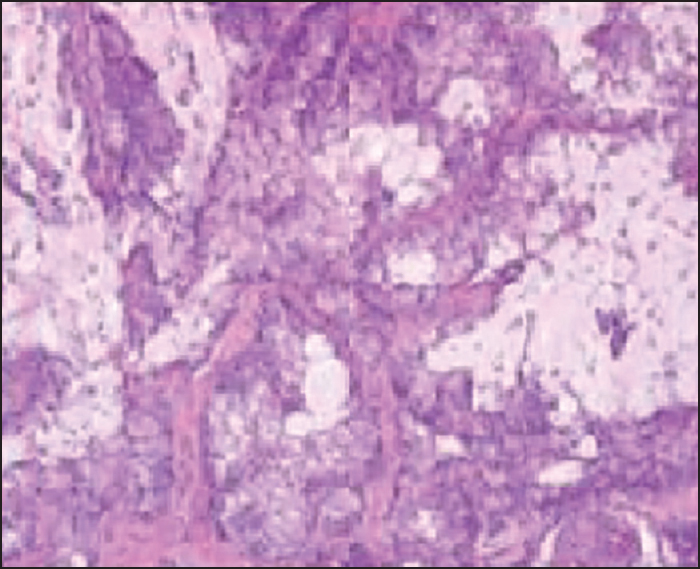 When the epidermoid constituent predominates, the histological appearance of the tumor may closely resemble that of squamous cell carcinoma, and it is thus classified as a high-grade MEC tumor [Figure 6] conversely, the presence of mucin-producing cells within a predominantly cystic architecture is regarded as low-grade MEC tumors. The morphological appearance of MEC share similarities to metastatic clear cell renal adenocarcinoma and clear cell bronchogenic squamous carcinoma. Hence, appropriate work-up of the patient must also include imaging of the lungs and kidneys. One of the most important criteria for measuring the biological behavior and aggressiveness of MEC is cell proliferation. The proliferating cell nuclear antigen expression increases with the grade of malignancy. Furthermore, mucin expression patterns can be useful for diagnostic and prognostic purposes. Membrane-bound mucins are expressed on the cell surfaces of MEC. Studies have shown that the presence of MUC-1 is related to aggressive tumor, while MUC-4 conferred greater cellular differentiation and better prognosis. , Cytokines have also been studied where over-stimulation of cell growth have been implicated in tumor growth. Batsakis JG. Salivary gland neoplasia: An outcome of modified morphogenesis and cytodifferentiation. Oral Surg Oral Med Oral Pathol 1980;49:229-32. Cornog JL, Gray SR. Surgical and clinical pathology of salivary gland tumors. In: Rankow RM, Polayes IM, editors. Disease of the Salivary Glands. Philadelphia, Pa: WB Saunders Co.; 1976. p. 99-142. Stewart FW, Foote FW, Becker WF. Muco-Epidermoid tumors of salivary glands. Ann Surg 1945;122:820-44. Foote FW Jr, Frazell EL. Tumors of the major salivary glands. Cancer 1953;6:1065-133. Goode RK, Auclair PL, Ellis GL. Mucoepidermoid carcinoma of the major salivary glands: Clinical and histopathologic analysis of 234 cases with evaluation of grading criteria. Cancer 1998;82:1217-24. Nascimento AG, Amaral LP, Prado LA, Kligerman J, Silveira TR. Mucoepidermoid carcinoma of salivary glands: A clinicopathologic study of 46 cases. Head Neck Surg 1986;8:409-17. Califano L, Zupi A, Massari PS, Giardino C. Indication for neck dissection in carcinoma of the parotid gland. Our experience on 39 cases. Int Surg 1993;78:347-9. Gray JM, Hendrix RC, French AJ. Mucoepidermoid tumors of salivary glands. Cancer 1963;16:183-94. Evans HL. Mucoepidermoid carcinoma of salivary glands: A study of 69 cases with special attention to histologic grading. Am J Clin Pathol 1984;81:696-701. Rosai J, editor. Major and minor salivary glands. In: Ackerman′s Surgical Pathology. 2 nd ed., Vol. 1. St Louis, Mo: Mosby Year Book Inc.; 1996. p. 815-56. Jakobsson PA, Blanck C, Eneroth CM. Mucoepidermoid carcinoma of the parotid gland. Cancer 1968;22:111-24. Spiro RH, Huvos AG, Berk R, Strong EW. 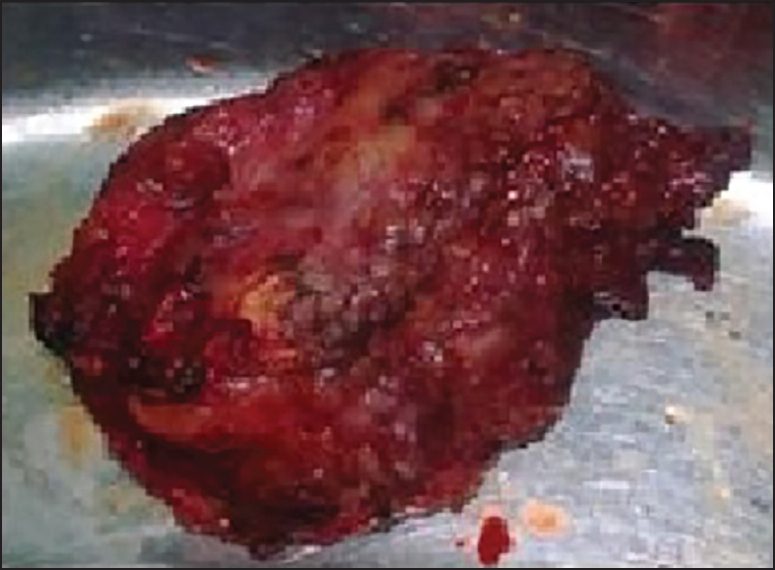 Mucoepidermoid carcinoma of salivary gland origin: A clinicopathologic study of 367 cases. Am J Surg 1978;136:461-8. Ostman J, Anneroth G, Gustafsson H, Tavelin B. Malignant salivary gland tumours in Sweden 1960-1989 - An epidemiological study. Oral Oncol 1997;33:169-76. Dillard DG, Muller S, Cohen C, Bloch D, Del Gaudio JM, Gal AA. High tumor grade in salivary gland mucoepidermoid carcinomas and loss of expression of transforming growth factor beta receptor type II. Arch Otolaryngol Head Neck Surg 2001;127:683-6. Auclair PL, Goode RK, Ellis GL. Mucoepidermoid carcinoma of intraoral salivary glands. Evaluation and application of grading criteria in 143 cases. Cancer 1992;69:2021-30. Bradley PJ. Distant metastases from salivary glands cancer. ORL J Otorhinolaryngol Relat Spec 2001;63:233-42. Cardoso WP, Denardin OV, Rapoport A, Araujo VC, Carvalho MB. Proliferating cell nuclear antigen expression in mucoepidermoid carcinoma of salivary glands. Sao Paulo Med J 2000;118:69-74. Alos L, Lujan B, Castillo M, Nadal A, Carreras M, Caballero M, et al. Expression of membrane-bound mucins (MUC1 and MUC4) and secreted mucins (MUC2, MUC5AC, MUC5B, MUC6 and MUC7) in mucoepidermoid carcinomas of salivary glands. Am J Surg Pathol 2005;29:806-13. Handra-Luca A, Lamas G, Bertrand JC, Fouret P. MUC1, MUC2, MUC4, and MUC5AC expression in salivary gland mucoepidermoid carcinoma: Diagnostic and prognostic implications. Am J Surg Pathol 2005;29:881-9. Yook JI, Lee SA, Chun YC, Huh J, Cha IH, Kim J. The myoepithelial cell differentiation of mucoepidermoid carcinoma in a collagen gel-based coculture model. J Oral Pathol Med 2004;33:237-42.